Safe for all skin types, including tanned and naturally dark-skin type individuals! Laserfacials are a powerful tool that helps improve the appearance of Rosacea, flushing, redness, melasma, sun-damaged skin, age spots, skin texture, hyperpigmentation, acne and aging. It reduces large pores, corrects dark circles around the eyes, reduces fine lines and tightens your skin. Get younger looking skin in less than 15 minutes with zero downtime and refreshes and stimulates the collagen on your skin. Our 1064 ND:YAG laserfacial works by focusing a beam of light to a target in the skin (such as enlarged blood vessels and irregular chromophores). The enlarged vessels and irregularities are removed without scarring or damage to the treated or surrounding area. Small precise pulses of light penetrate your top layer of skin reaching the dermal region making this an effective medical treatment. 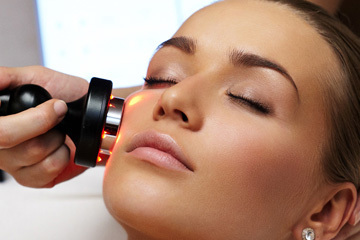 The laserfacial treatment involves little-to-no downtime. You can expect to return to your normal activities immediately following the procedure. However, there are some post-care instructions provided to all patients, including a strict adherence to sun protection. This includes daily application of a high-quality sunscreen as well as avoiding direct sunlight. This is important because your skin will be more sensitive to harmful UV-rays than usual. We will also recommend that you adhere to a strict sun protection regimen once you've healed to avoid future sun-damage and skin irritation. Most Lasers Aren't Safe for Dark Skin Tones. How is the Ultra Smooth Skin Laserfacial Different? Many laser treatments do more harm than good for naturally dark skinned patients, leading to more extensive hyperpigmentation. Furthermore, the provider's knowledge and skill in treating dark skinned patients is of paramount importance to getting the right results. Our providers will ensure that your laserfacial treatment is customized to your needs. We encourage you to ask questions about your laserfacial treatment during your consultation. We want to ensure your total comfort and trust in the procedure as administered by our knowledgeable and experienced providers, all of whom have over 48 years of combined experience! What Other Laser Options are Offered? We offer a variety of laser technologies at Ultra Smooth Skin's three convenient locations in Scottsdale and Chandler, AZ. While we do offer lasers that carry brand-name recognition, including Fraxel and Clear+Brilliant, we will recommend whatever laser technology is best to address your skin care needs. Why Choose Ultra Smooth Skin for a Medical Laserfacial Treatment? Lisa Williams, ANP-C, founder and owner of Ultra Smooth Skin in Scottsdale and Chandler, AZ, is an experienced provider and trainer in laser safety and treatments for cosmetic applications. In addition to training our own providers here at Ultra Smooth Skin, Lisa also trains and certifies aestheticians and nurses in Arizona. Lisa is also a former medical laser safety officer and developed the criteria used to train and certify laser technicians in Arizona. Medical lasers stimulate Collagen giving you less wrinkles, more of a refreshed look, tighter skin and helping with break outs. Individual results could vary and depends on the individual.